Conservative Leader Andrew Scheer attempted to revive his party's fortunes in Quebec Monday by declaring his openness to the provincial government's immigration demands. But he avoided questions about whether he would back efforts to build a new pipeline that would cross Quebec. Conservative Leader Andrew Scheer attempted to revive his party's fortunes in Quebec on Monday by declaring his openness to the provincial government's demands for immigration reforms. But Scheer avoided discussing his support for a controversial oil pipeline that would run through Quebec. Premier François Legault said last month such a pipeline wouldn't be socially acceptable in the province. Scheer supports revisiting TransCanada's Energy East project, which would carry Alberta crude across the country to refineries and export terminals in New Brunswick. TransCanada killed the project in 2017 amid widespread opposition in Quebec. However, the current volatility in Alberta's oil prices, caused in part by limited pipeline capacity, has generated renewed interest in Energy East in some quarters. At a news conference in Montreal, Scheer was asked if he would ensure the pipeline gets built, despite Quebec's objections. The Conservative leader suggested that some common ground could be found between Legault's opposition to the project and the federal Conservatives' desire to see it go ahead. "I'm confident that we can work in a collaborative way with the government of Quebec to address some of their legitimate concerns, while at the same time ensuring that we get big national energy projects built to become self-sufficient when it comes to energy in our country," he told reporters. Scheer was then asked whether he agreed with Legault's statement that there is no social acceptability for a new pipeline. He did not answer that question directly, saying only that Quebecers would support efforts to reduce oil imports from foreign countries. 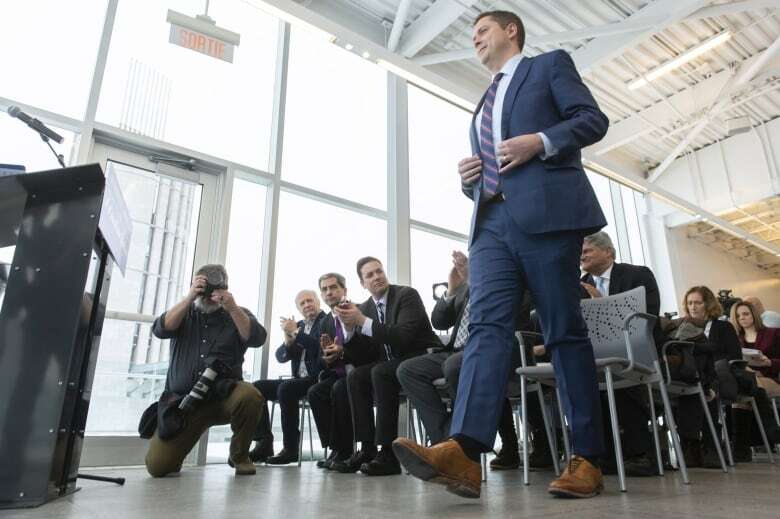 "There is no social licence or social acceptability for oil and gas that is brought in from countries like Saudi Arabia, like Algeria, like Venezuela, where there aren't those same environmental protections or those same commitments to human rights," Scheer said. Quebec gets a small percentage of its oil from overseas. According to a recent National Bank estimate, 82 per cent of the province's crude oil came from North America in 2017, including 44 per cent from Western Canada. Around 11 per cent came from Algeria. Recent polls show that despite winning June's byelection in Chicoutimi–Le Fjord, Conservative support in Quebec has stalled. CBC's Poll Tracker suggests the Liberals currently enjoy a nearly 20-point lead over the Tories in the province, compared to a 12-point gap in May. 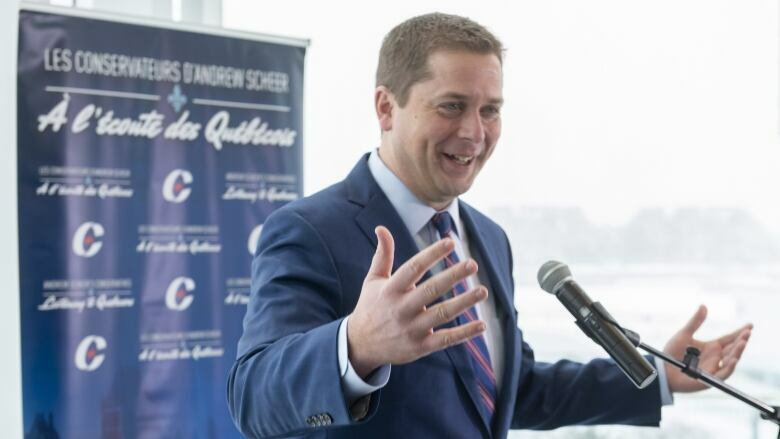 Scheer was in Montreal on Monday to announce a series of promises aimed at boosting his party's fortunes in Quebec. Among them: giving the province more autonomy in immigration issues. 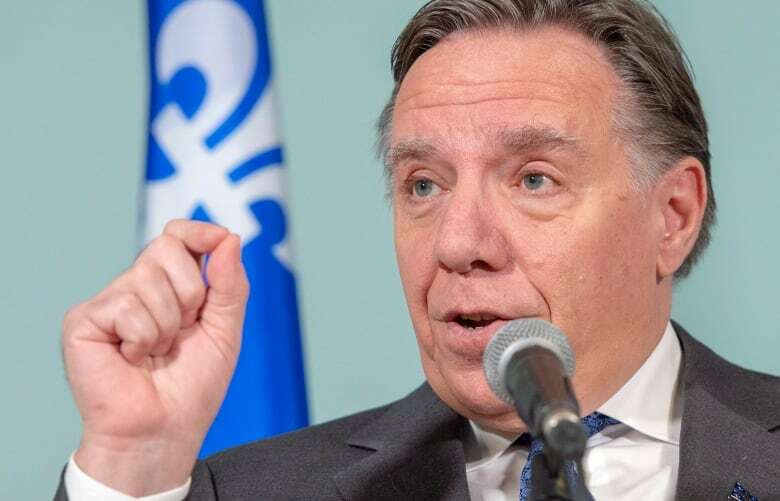 Legault's Coalition Avenir Québec government is moving ahead with plans to lower immigration levels and is negotiating with Ottawa to take over the family reunification program. "We are open to looking at all of Mr. Legault's proposals," Scheer said. But he didn't specify what powers a Conservative government would transfer to Quebec. He also remained vague about whether he supported the CAQ's plan to reduce by more than 20 per cent the number of immigrants Quebec accepts annually. "Canada needs to have an immigration target based on our needs — needs for our economy and needs to ensure we have population growth," Scheer said. "That number has to be arrived at based on facts and evidence." Earlier on Monday, Immigration Minister Ahmed Hussen reiterated Ottawa's opposition to the CAQ's plan to cut immigration levels. "We don't agree with that approach," Hussen said in Ottawa. "We believe that what the Quebec economy needs, just like the Canadian economy, is more workers." The other policy proposals the Conservatives tailored for Quebec voters include backing the CAQ's demand to collect federal income taxes and help it address the current labour shortage by encouraging retired workers to re-enter the labour market.